(NaturalNews) With summer in full force, many are embracing commercial sunscreens in a misguided effort to minimize burning and reduce skin cancer risk. Unfortunately, most sun care creams, sprays and gels are filled with photocarcinogenic ingredients and other harmful chemicals that actually encourage DNA damage. Yet protecting the skin need not involve exposure to these noxious products - a host of natural substitutes are available that nourish and shield without dangerous side effects. According to author Ethan A. Huff in the NaturalNews article, "Study: Many sunscreens increase skin cancer risk, FDA has known for a decade but done nothing," commercial sunscreens create more harm than good by escalating the incidence of skin cancer. Photocarcinogenic ingredients like the vitamin A derivatives retinol and retinal palmitate turn toxic when exposed to sunlight - causing a 21 percent increase in the development and spread of cancerous skin tumors and lesions. 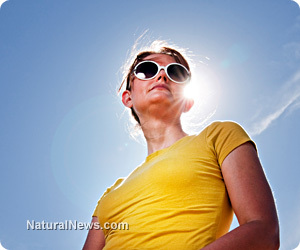 "Vitamin A derivatives, of course, are not the only toxic ingredients in sunscreens either. According to the EWG report, hormone-disrupting chemicals like oxybenzone are prominent in many popular sunscreen brands. These same sunscreens also contain a slew of other mystery chemicals, many of which have never been proven safe or effective for use, and are likely carcinogenic as well." In light of this information, it's understandable that alternatives to these poisonous concoctions are sought once we are aware of the dangers. "Vitamin A, an antioxidant nutrient found in foods such as eggs and fish, has been shown in many studies to prevent and reverse cancerous changes in cells in some parts of the body, including the skin. One previous study found that people taking 25,000 IU of vitamin A per day for up to five years had a 32 percent reduction in risk of developing a common form of skin cancer." "... multiple studies have found that the combination of vitamin C and vitamin E protects the skin against UV damage. Human subjects orally co-supplemented with vitamins C and E show increased Minimal Erythemal Dose (MED), a measure of photoprotection from UV light in skin. The combination of the two vitamins was associated with lower amounts of DNA damage after UV exposure. Results of another study suggest a mixture of tocopherols and tocotrienols may be superior to alpha-tocopherol alone, as the mixture showed reduced sunburn reactions and tumor incidence after UV exposure in mice."